The SCE-M is a heavy-duty horizontal centrifugal process pump with permanent magnetic drive complying with the latest edition of API 685. It's 100% leakage free performance allows the safe handling of hazardous and volatile fluids. Applications Petroleum Refining, Production and Distribution, Petrochemical, Refineries, Heavy-duty Chemical, Gas Industry Services, Power Plants, Utilities. Based on the worldwide proven hydraulic design of the SCE model, the SCE-M is a sealless centrifugal pump, 100% leakage free, avoiding high maintenance costs and usage of mechanical seals. It is the best option for heavy chemical handling applications, in completion to API 610 pumps for the majority of applications in the pretrochemical industry and refineries. With over 130 hydraulic combinations available for the SCE-M pump, almost all customer requirements are met. 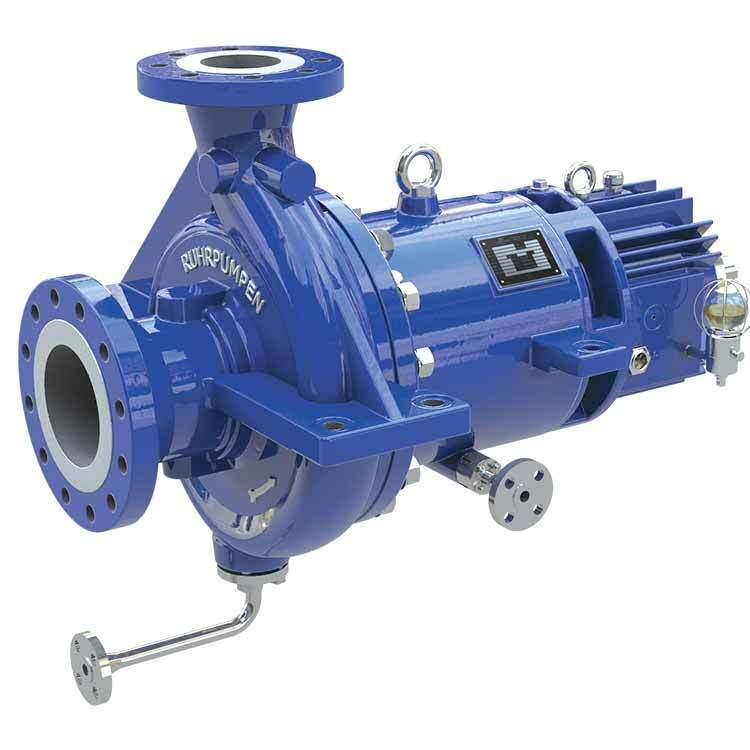 To enhance performance and optimize efficiencies, the SCE-M counts with three different impellers for each pump size. It is built with the latest engineering techniques and tools such as 3D modelling and Finite Element Analyis to assure the best product quality. By eliminating leakage and removing unreliable seals from the design, Ruhrpumpen Sealless Magnetic Drive Pumps have a positive environmental impact and improve industrial safety over traditional sealed designs.